Now, I am all for imagination and pushing the food boat boundaries but I may have pushed this a little far for the kids last night. They like broad beans, they like pasta but the two together some how didn’t do it for them! My husband on the other hand couldn’t get enough of it. I thought it was a bit tasty and considering I made it I wasn’t going to start getting too fussy. This to me solves the problem of waste, waste? Maybe that’s a bit harsh I do get beans from this plant but are you getting me? 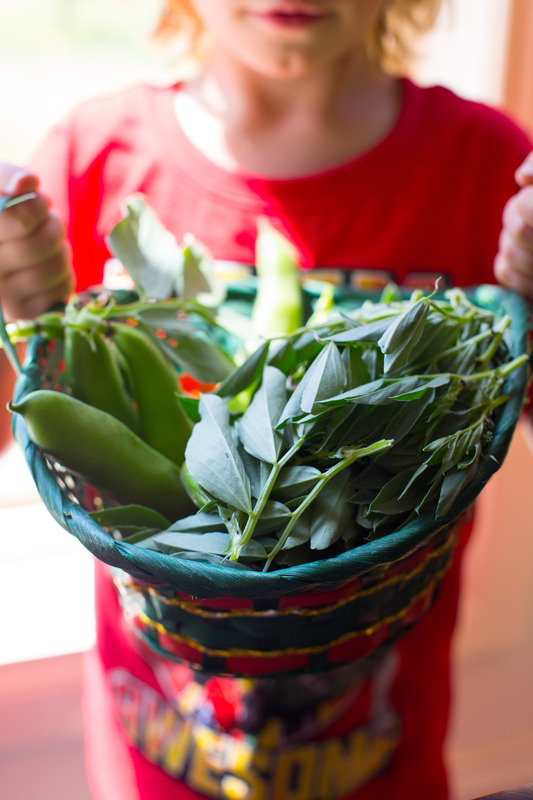 Using the tops of the broad beans seems a sensible idea and treating them a bit like spinach works a treat. They have this subtile flavour of bean but has a spinach-y type vibe going on. My little garden helper gratefully obliged with the picking not so much with the eating. 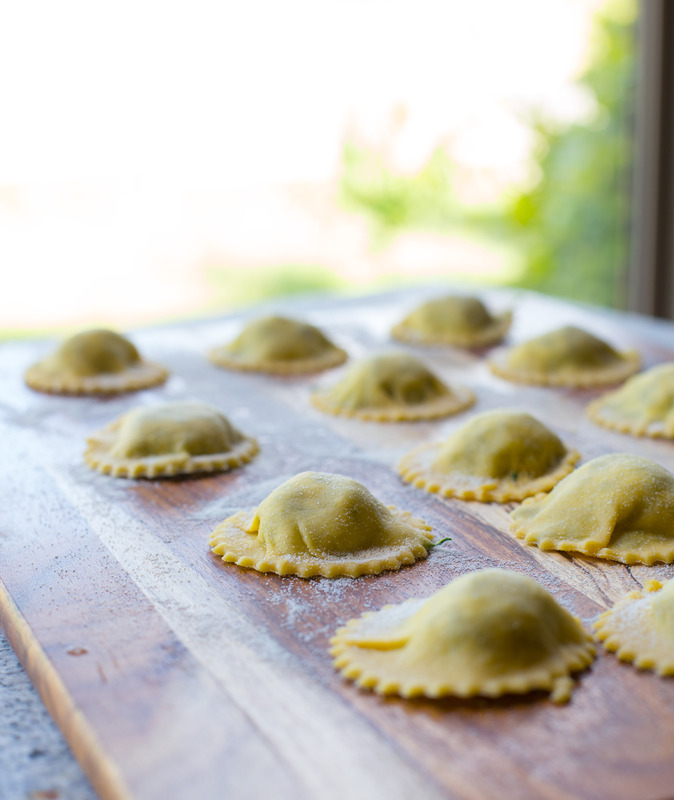 It’s a bit of prep with the pasta but go ahead use some prepared stuff or instead of making the ravioli just make it into spaghetti and mix the filling through, top with the pesto and hey presto dinner is done. Like how I did that? pesto/presto, ok enough of the bad jokes. Nice Olive Oil, fresh young broad bean leaves, chives flower and some parmesan to finish off the dish. First make the pasta dough allowing time for it to rest. Start now on the filling. Bring a pan of water to the boil and blanch the bean tops for 1 minute and then plunge into cold water. Leave to cool draining then squeeze all the moisture out of it. Finely chop. 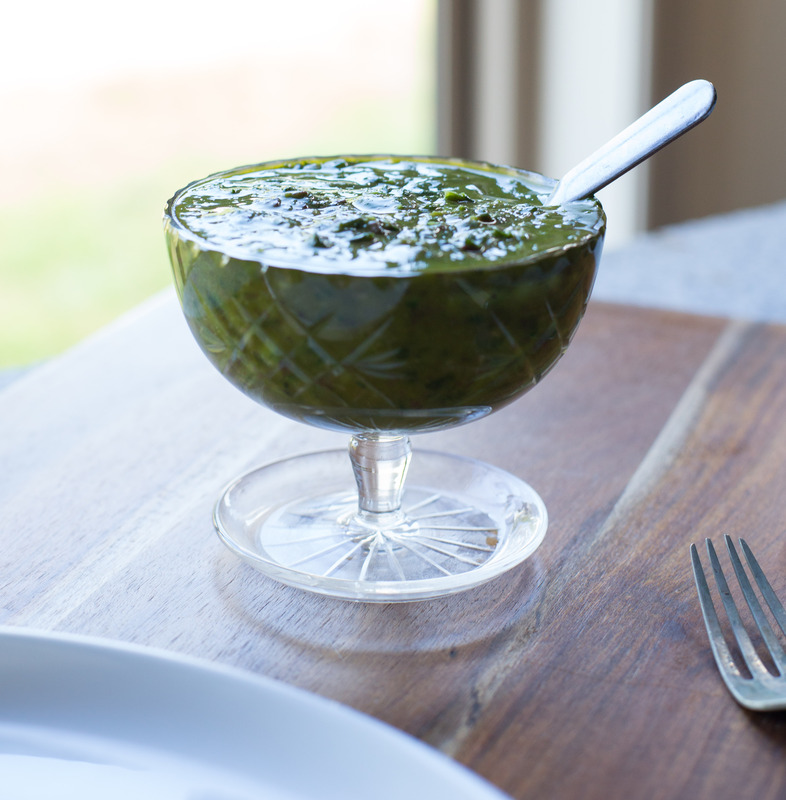 Set aside and move on to the pesto. 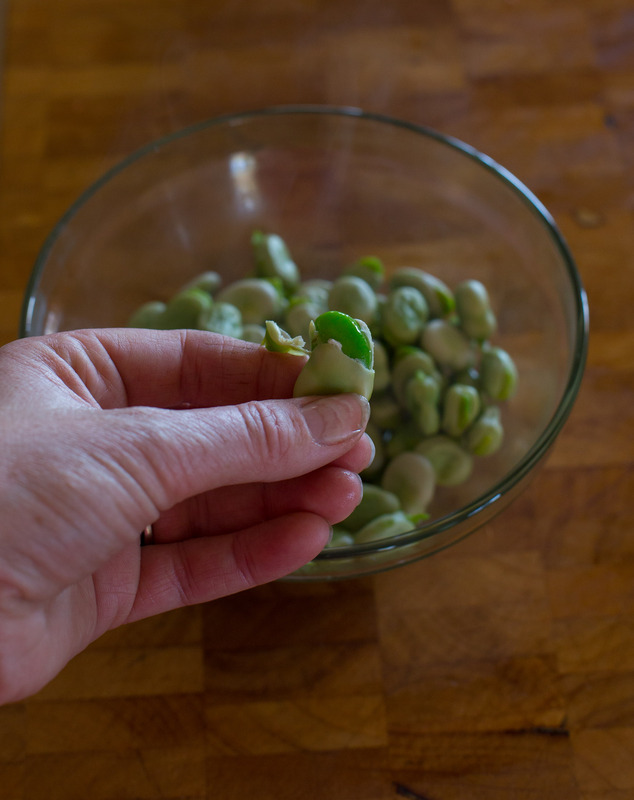 Blanch the broad beans for 2 minutes and allow to cool. Once cool enough to handle remove the outer slightly tough bitter skin. Excuse the photo. My gardening hands is all I had available. Toast the almonds in a dry frying pan and with the garlic pop these into a blender and whizz until you have some nice chunks. Add the beans, cheese, lemon juice and whizz again. Slowly add the oil as you are whizzing and season with salt and pepper. I left mine chunkier than I usually do. Right back to the pasta. Are you still with me?? 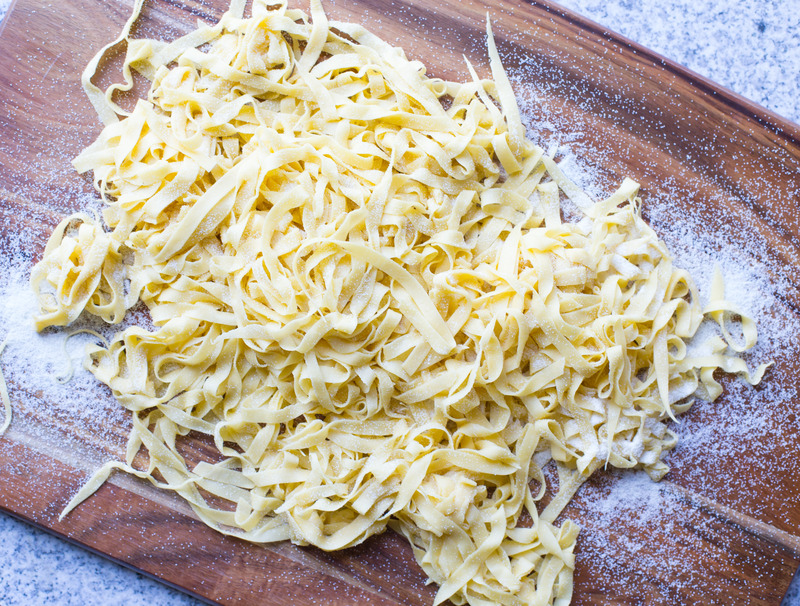 Roll out the pasta either by hand or by machine. I choose machine. With the kitchenaid I take it to no.5 or 6. As long as you can read a newspaper through it (would you really?) you have reached the target thin point. Spoon teaspoonfuls of the mix onto one layer of pasta. Take a pastry brush, dip into egg wash (1 beaten egg with a splash of water to loosen the mix) and brush all around the filling where the top layer of pasta will sit. MAKE SURE YOU REMOVE ALL AIR POCKETS OUT OF YOUR PASTA. PARCELS. Otherwise you have an event of the exploding pasta. Ok I might be being a little dramatic but you don’t want these babies to fall apart in the water after all your hard work. I would cry. Cut these pockets of garden goodness however you please. I have a fancy little cutter that helps me out. Dust with pasta flour or semolina to stop then sticking. Cook for 2-3 mins in boiling water. They will start to float to the surface. Once cooked drain and serve immediately to awaiting mouths. 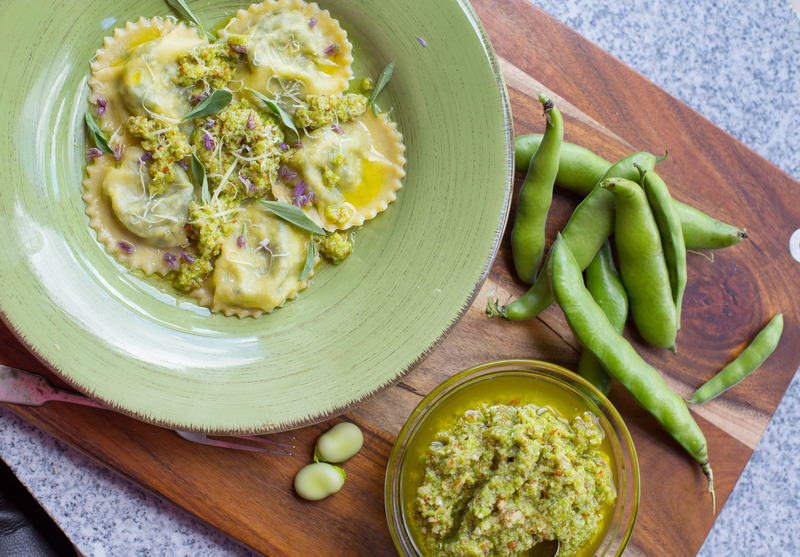 Top with the pesto, a few gratings of cheese, a splash of olive oil and some tender young broad bean leaves and maybe some chives flower to make it look fancy. Dive on in. Enjoy these beautiful green beans in all their glory. 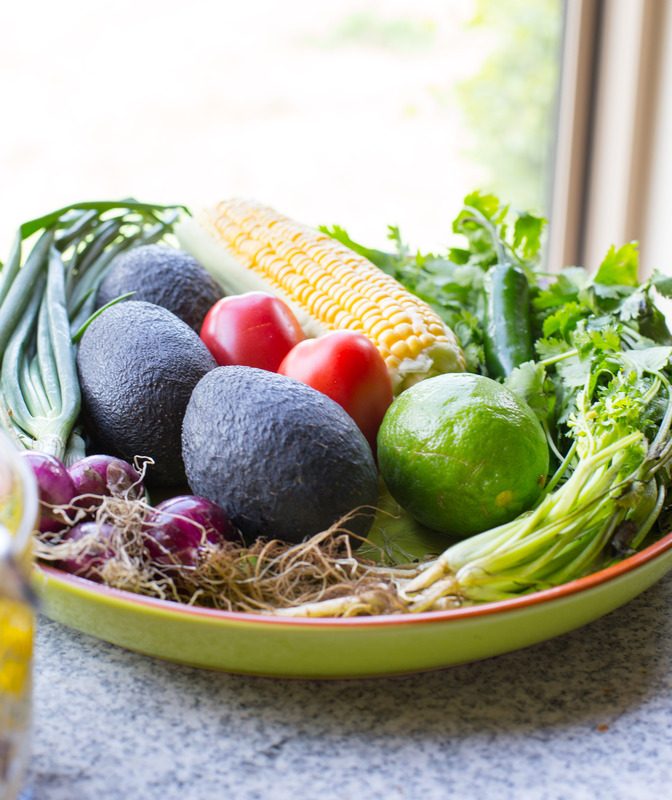 The Avos are superb at the moment and I am loving every moment of my Barham Avocado 10kg box. We get through a few in our family. This salad just screams summer is nearly here and being able to crank up the ‘Barbie Mate’ just adds the cherry on the top. Have you guested I live in Australia? If you want to have a go at making your own corn tortillas and can get hold of the Masa Harina , be my guest. I had some in the freezer so I had a play. Its tricky! 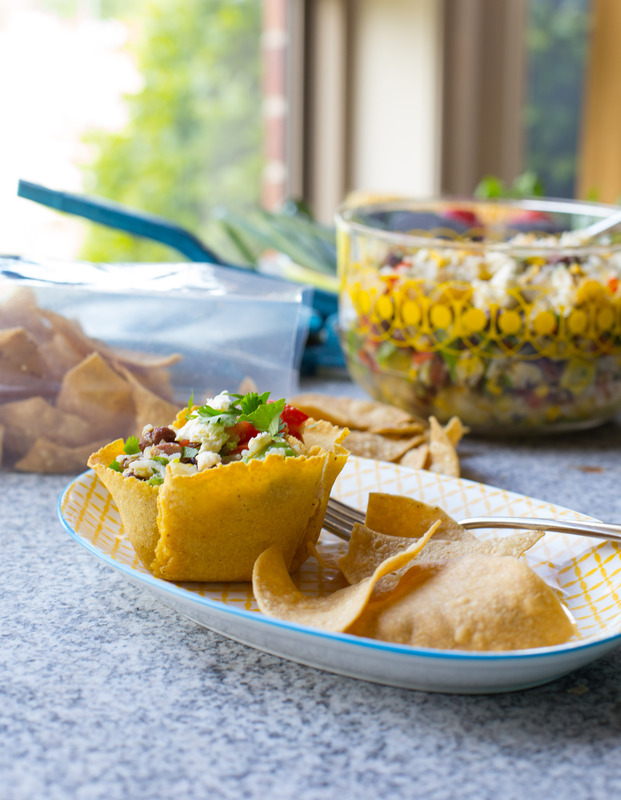 The best corn tortillas and corn chips hands down are from La Tortilleria find them here to order the authentic AMAZING tortillas and tortilla corn chips. Yes they post them to you how freaking awesome is that? I use these more often than not and I love that these are made using traditional methods and Australian corn (not sponsored by the way I just love them). As much Chipotle in Abodo sauce as you can handle, mine is super spicy so I used a little bit. If you can’t get this try using some smoked tabasco or even some smoked paprika if you are struggling. This will give a deep smoky flavour to the dressing. 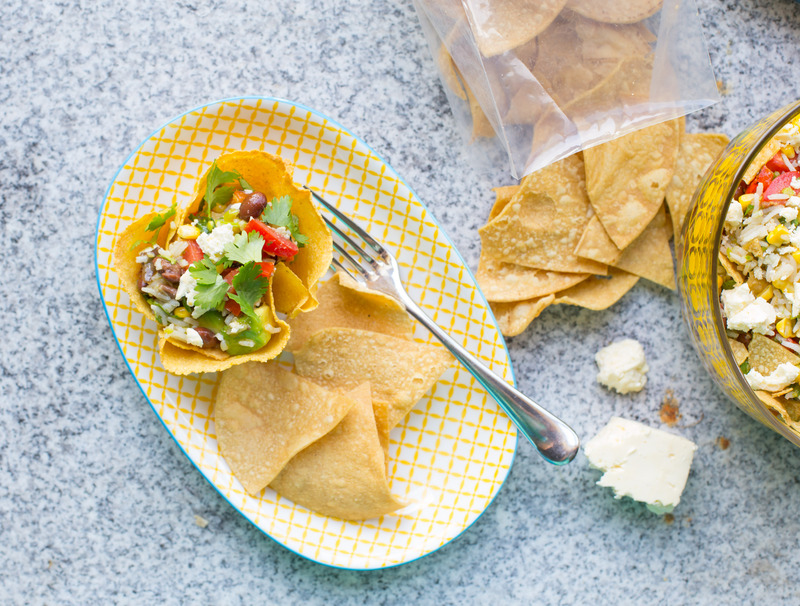 A couple of handfuls of corn chips and a sneaky few for yourself you won’t be able to resist especially if it’s the La Tortilleria ones! Make up the salad dressing but throwing everything into a jar with a good lid and give it a good shake. Taste, check for seasoning and once you are happy with it leave to the side while you prep the salad. 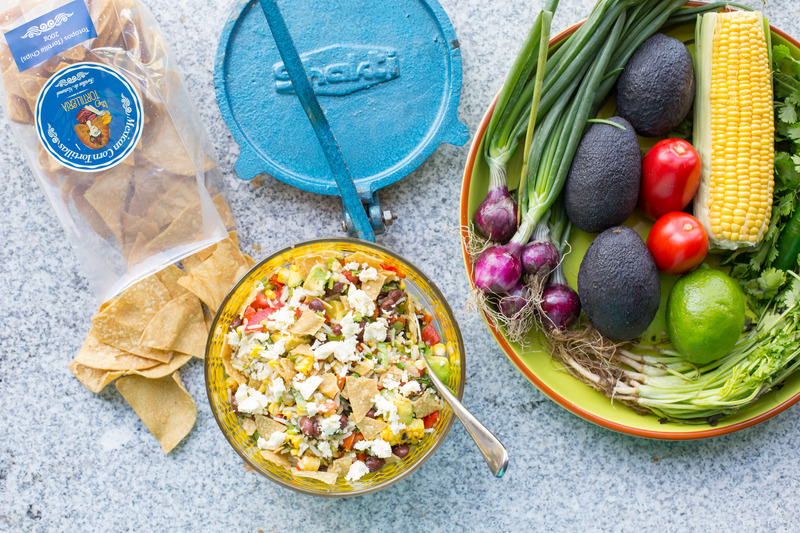 Turn the heat up the BBQ or a Griddle pan to smoking hot and pop the peppers, corn and spring onions on the griddle. Cook these until they start to get the black scorch marks them then turn so the other side gets suitably charred. Place these on a plate to cool slightly before handling and chopping into a dice. With the corn stand it on its end and slice down to remove the kernels. Add the rest of the salad ingredients to a bowl plus the charred veges. Add the dressing probably half at a time and taste in between as you don’t want to drown your salad. I used the lot in mine. 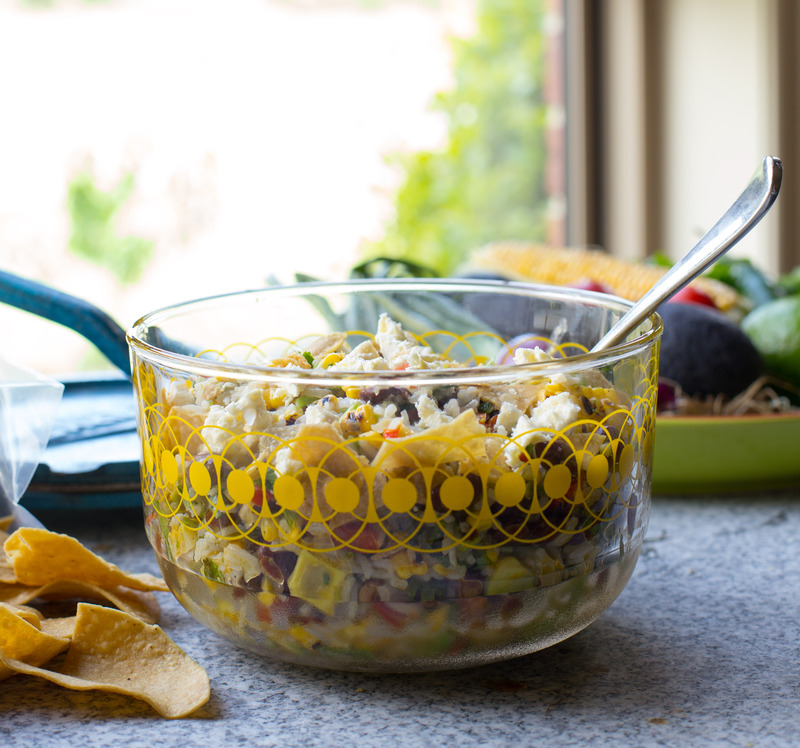 Go easy on the mixing as you don’t want the avocado to turn to mush. Lastly just before you serve crumble the chips and cheese over the salad and lightly mix this through. GENTLY. I say leave this bit to last as you still want the chips to retain the crunch when you serve. Its worth the crunch I assure you. Thats it, done, serve, repeat! As you see above I served mine in a little basket made of tortilla. Just slightly warm and corn tortilla and bend this baby around a muffin tin, cook in a 180*c fanbake oven for 10 mins or less you will see it starting to take on a bit of colour. Leave in that position to cool completely before removing. I can’t boast about my spring garden, I don’t really have one! It’s the remnants of my Summer garden. It did keep us in greens over the winter but now we are warming up EVERYTHING is going to seed. As I was pulling these 6ft monsters out of the garden I was pulling off and saving some of the tender smaller leaves to do something with. I had to be quick. I had 2 helpers Mr 2 and Mr 4 eager to drag the plants to the chooks. I took the silverbeet inside, washed thoroughly as I had some unwanted residents living on it and sat a stared at it for a few minutes. “OK how can I jazz things up with this so-called dirt plant?” I’ve done all the usuals-quiche, pie, salad, green pasta sauce then it hit me, Salsa Verde but instead of herbs I’ll use silverbeet. It was worth a risk. I had no idea if it would work. I was going for it. My Husband ate it, had seconds, thanked me for a delicious accompaniment to his meal then asked “What was that green sauce?” AH HA! I’ve done it, he eats dirt plant and likes it!! Anyway enough about me winning, here’s the recipe. Up to 100ml Olive Oil, depending on how loose you want the mix. 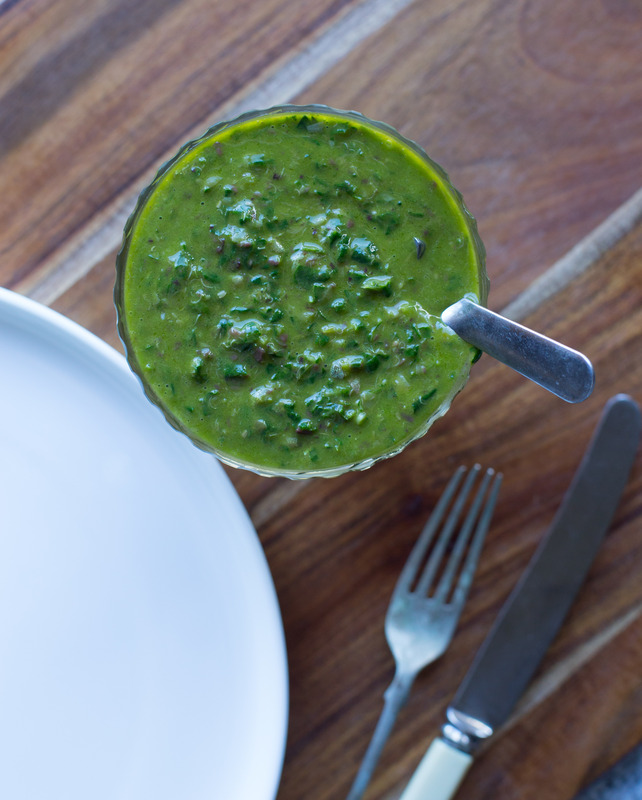 Chuck all the ingredients (except the oil) into a blender and whizz until you just about have desired texture. Drizzle olive oil while the motor is running. That’s it folks. An easy way to make your meal a little interesting tonight. It’s super scrummy on roast veges and feta. Its Tuesday again? Where has the week gone? The year what year? Oh my gosh my ‘where is santa’ app on my phone has just told me that santa is relaxing in the North pole reading an interesting book but wait for it… there is 58 days 10 hours 41 minutes and 20 seconds until his arrival. SERIOUSLY I can’t cope. Especially today. Mr 3 has turned 4 today and every birthday my children have I start to look back at the year wondering where it has gone. I’m in complete denial. It that ok? Can, as mothers not admit that our kids are growing up even if its just for a moment? That precious second when you look into your newborn babies eyes and think ‘holy crap what do I do now?’ Is now please don’t grow up I still need cuddles, its all going to fast. Anyway back to what I do, food. I wasn’t going to post today as I’m completely consumed by Mr 4s birthday but I had to make lunch and I figured a few clicks of the camera I could post this recipe too. He chose to eat a vegemite sandwich and as a treat a jam sandwich, open sandwich if you don’t mind! What a birthday lunch. The recipe evolved while I was cooking it. I’ve been in love with watermelon and feta salads for as long as my adult palate can remember. Love that sweet/salt thang. But its been done over and over again. Due to my recent cheese making ventures with Corinne at Drysdale Cheeses I had a bit of a lightbulb moment.. (by the way her goats cheeses and yoghurt are something of a revelation and will convert any non goat cheese lover. 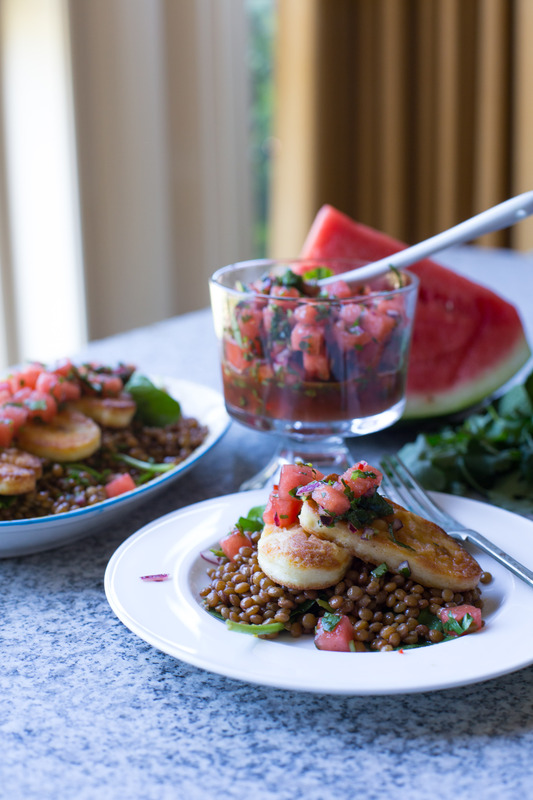 Seriously) how about a halloumi kinda thing with some kinda watermelon kinda thing. Yeah pretty vague but that’s how I roll. Just like that the salad was born. The ingredient list came as I cooked but the idea was there! 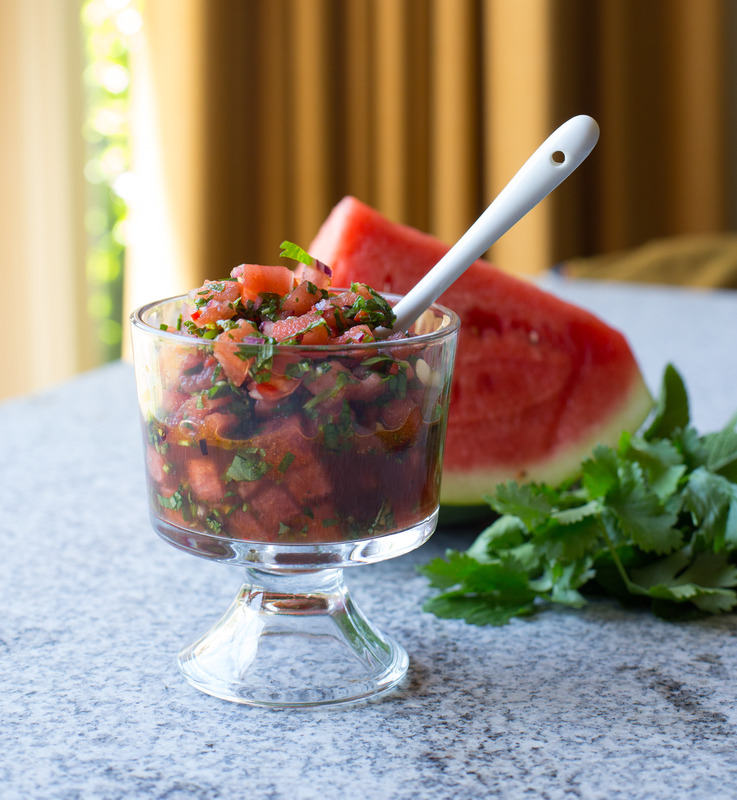 Simple really, chuck it all into a bowl and give a gentle mix, let it sit to rest to let the flavours develop. 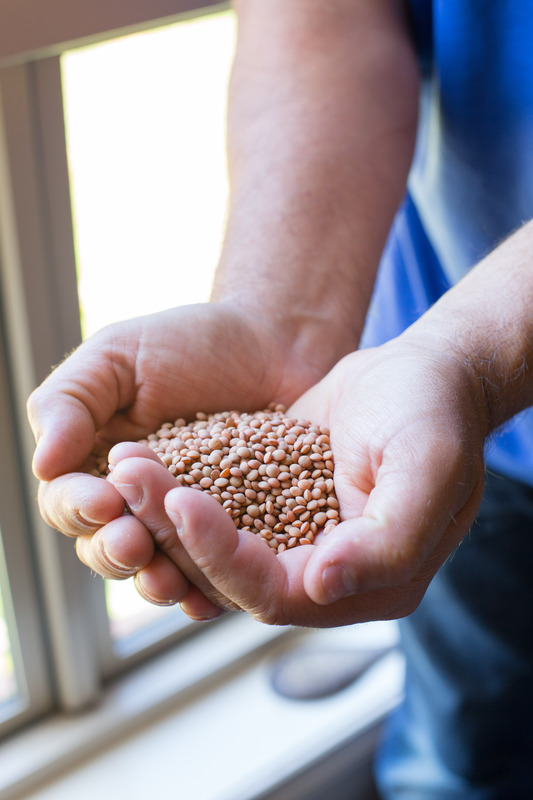 3/4 Mount Zero Red Persian Lentils or Puy Lentils, aren’t they just beautiful? Pop all the ingredients in a pan and bring to the boil. Turn to a simmer and cook for 30 minutes until just tender. These lentils are born to be ‘al dente’ they need that little bite to them. Give a mix and leave in the pot until ready to assemble the salad. Not blowing my own trumpet but the Halloumi in my photos was made by me. How cool is that? You need to speak to Corinne if you are interested in cheese making. Mix the cumin, flour, salt and pepper in a flat-bottomed bowl and coat the cheese. Heat a heavy based pan add a good tablespoon olive oil and fry the cheese until golden and crispy on each side. Keep warm while you assemble. 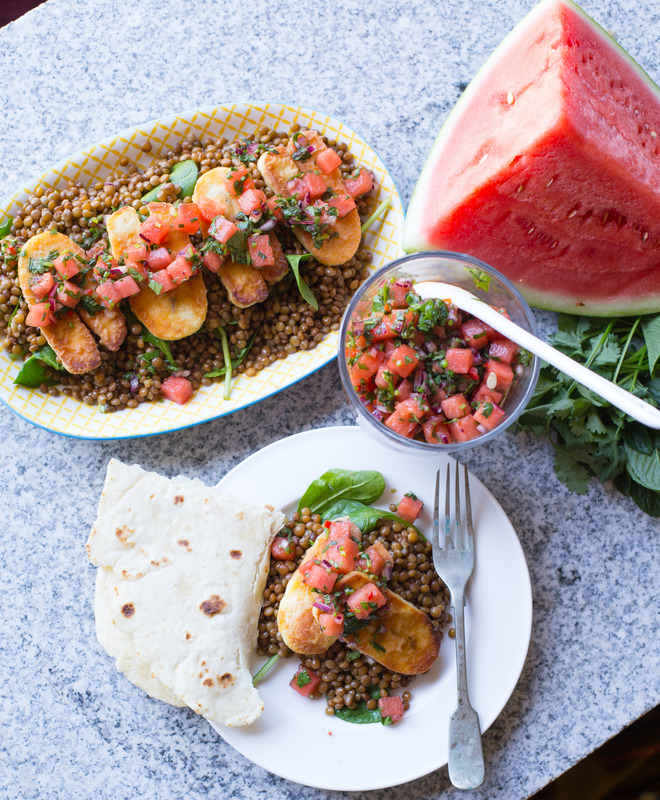 Grab a handful of baby spinach or something green from the garden (as long as its edible) and mix this through the lentils. Lay these little gems on a plate, pop the slices of halloumi on top and then the salsa. That’s it lunch it done. If you need an added hit of carbs to this my yogurt flat breads really do the trick. P.S This salad is lovely slightly warm, freshly made but will keep until the next day just bring to room temp before eating. As promised a sweet recipe coming your way today. I have been baking, averaging 2 cakes in a week due to helping out at my daughters school. It’s that time of the year when the future preps come for their transition sessions and the mums and dads hang about eagerly waiting in the staff room hoping that their 5 year olds settle in and are happy to be in the classroom. To help with their ‘nervous waiting’ and to have a sweet distraction some of the parents help to put some morning tea on for them. I hope it works. It did for me last year. 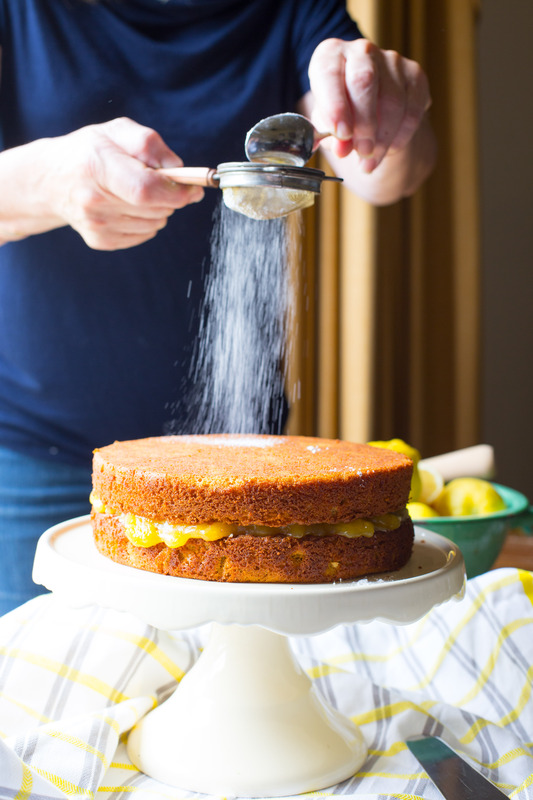 I’ve been baking a variety cakes and today its a super yum sponge. Rich caramel flavour thanks to the panela sugar, moist from the ground almonds and when you get to the lemony centre well what can I say? 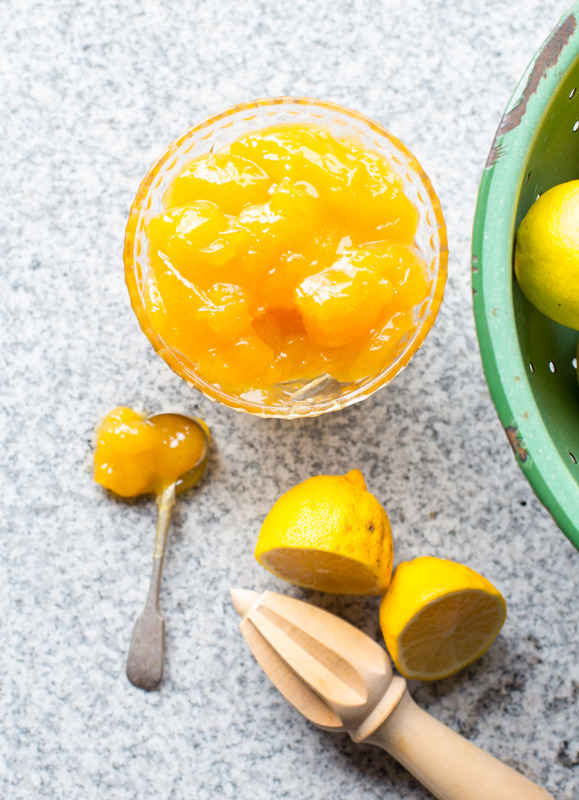 Zesty, sharp yet sweet with a lovely perfume of vanilla. 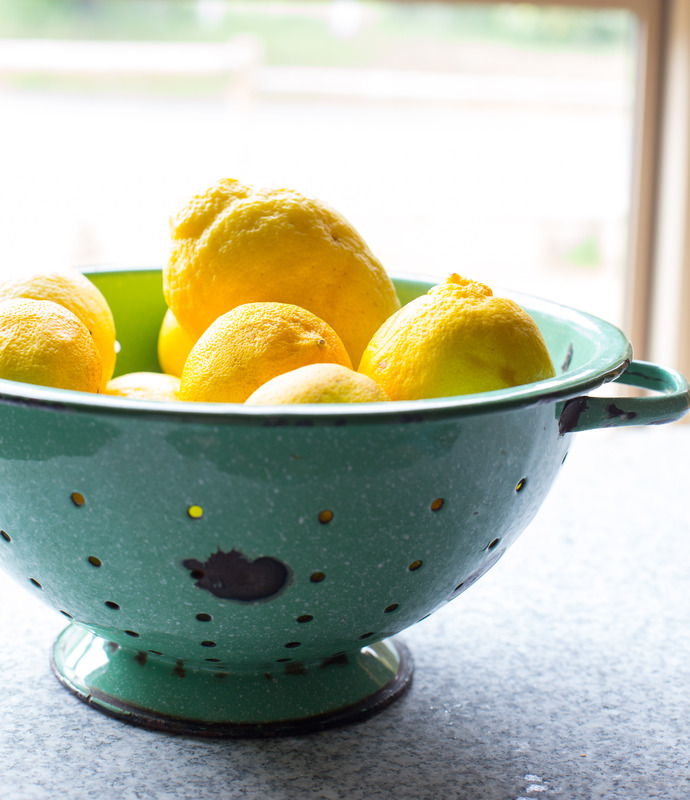 Its lemon season here and I have been gratefully accepting bags of home grown lemons, awesome really as my trees are babies and have no fruit yet. I’m calling this a ‘cheats curd’ as it hasn’t got eggs in it and its pretty foolproof. IT DOESNT SPLIT. Big thumbs up in my book and it hasn’t got loads of butter in it either so I suppose you could say its the economical version too. The ‘curd’ is quite thick, translucent and not so creamy and rich as a traditional curd. I’m a fan! I adapted the recipe to suit my taste. Mum has been making it for years. We are not sure where it originally came from whoever you are, thank you. I can’t believe I have to let this cake go, should I make another? My mum says YES! Like usual get the oven on to 180*c fan bake and grease 2×8 inch/20cm loose bottom tins. I also line the bottoms with greaseproof paper. 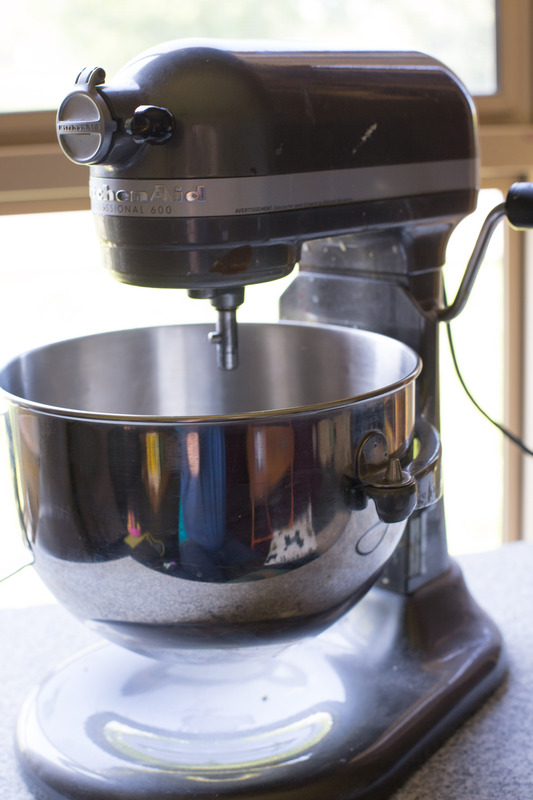 In a stand mixer/handmixer, mix the sugar and butter until pale and fluffy. It will look like fluffy caramel clouds due to the sugar don’t try to get it too pale! Crack all 4 eggs into a jug mix in vanilla and give a little stir and SLOWLY pour this into the butter mix. If it looks like its curdling throw in a spoonful of flour. Once the eggs have been added fold in the flour, baking powder, almond meal and salt. Lastly add the milk and fold through. Spoon the mix equally into the tins and smooth the tops. Bake for 20-25 mins. It will look a little darker than usual due to the panela sugar. Let the cakes cool for 5 mins in the tin before turning out and cooling on a cake rack. While the cake is cooling make the curd impostor. In a pan bring the water, sugar, zest and vanilla bean to a boil stirring to dissolve the sugar. Meanwhile mix the lemon juice, vanilla extract and custard powder together. Pour the custard powder mix into the lemon/sugar mix and put back on the heat and bring to a boil. Whisk, whisk, whisk we don’t want lumps or a sticky bottom. There’s nothing worse than a sticky bottom. Cook this out for 5 minutes until it has nicely thickened. 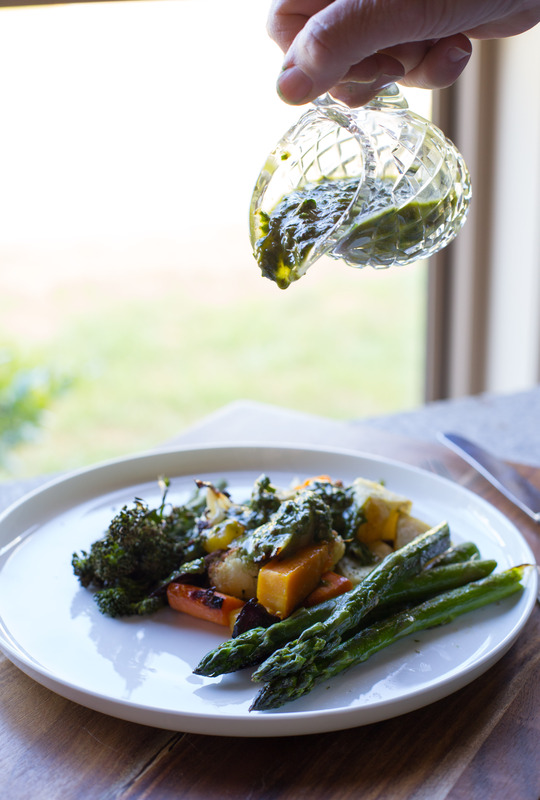 Pop this into a dish and cover directly on the surface with food wrap and cool in the fridge until ready to use. Once both parts are cooled its ready to assemble a great partnership. 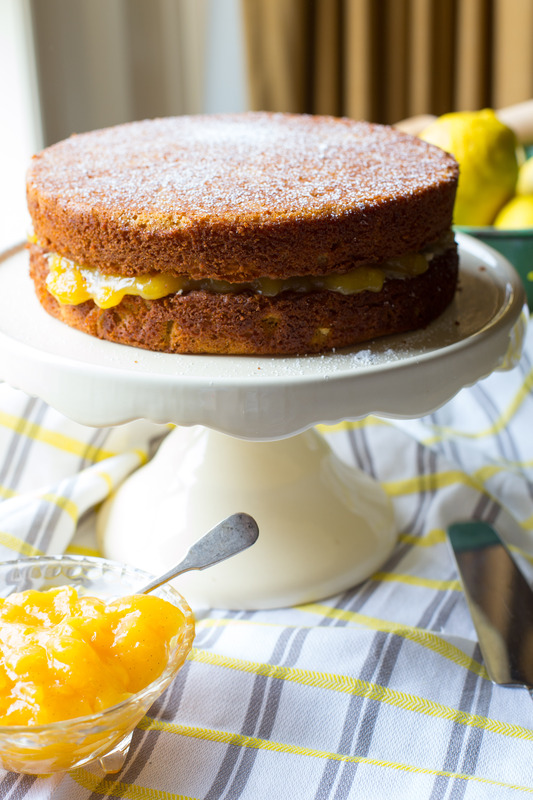 Place one cake on a pretty cake stand (well it could be anything you want really) and spoon on generous lashings of the lemon curd and then either..
Mum is still on at me to make her this cake for ‘helping’ out today! hmmm should I ?! P.S I would love to cut this and show you a big chunk of the inside but I am refraining for the good of the parents tomorrow. Welcome you lovely people. Enjoying the sunshine? (sorry northern hemisphere). 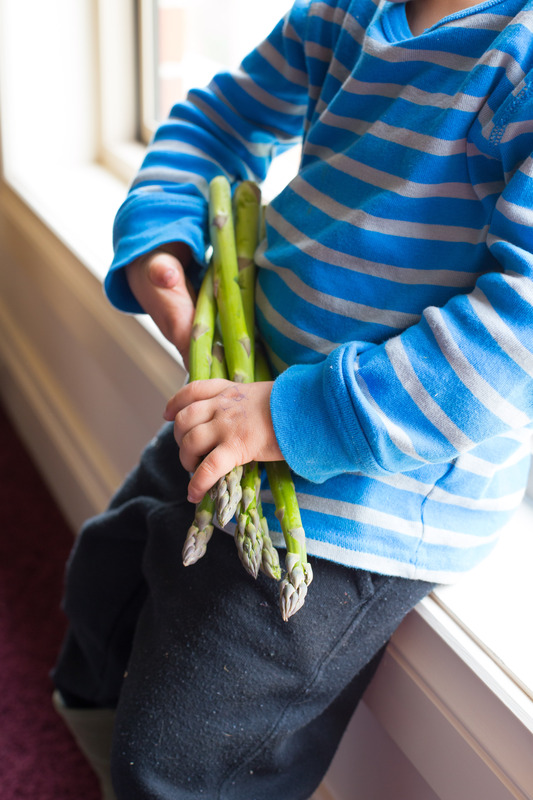 Today I’m on the asparagus train again (I promise next week I will move onto something else). Now that the weather is getting warmer I am favouring lighter meals. 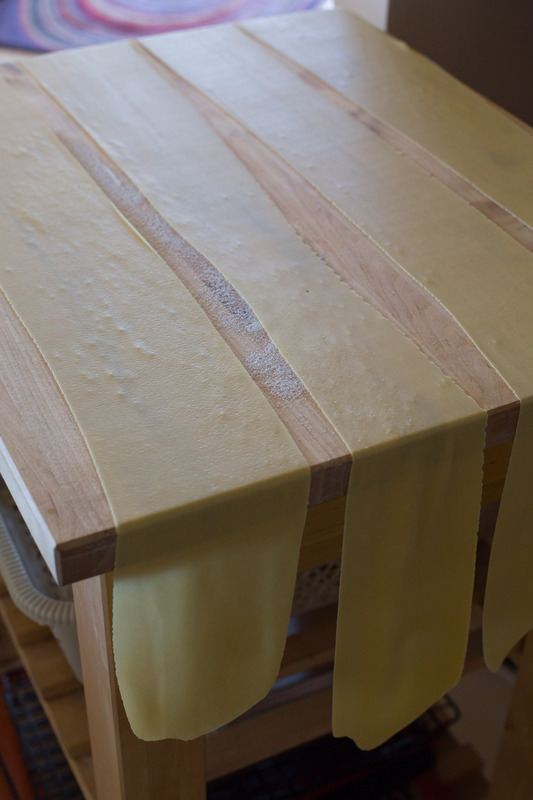 I love fresh pasta and its pretty easy to make. Yes I have the fancy attachments for my kitchen aid that rolls my pasta as thin as paper and then happily slices it into long thin strands of pasta-ery goodness. Introducing my righthand man in the kitchen.. Its the one, the only Dierks Chesterfield. Yes I name my appliances. Don’t judge. Now if you don’t have a dierks please keep reading you can still do this without the fancy equipment or getting hold of some fresh pasta at the shop is completely acceptable. If you get the urge to try making it, do it!! Its a pretty simple dish of asparagus, goats cheese, dill and a hint of lemon the only accompaniment I would suggest is a cold glass of Chardonnay to complete the meal. Mix all the above ingredients together either by hand or in a blender and when all combined start kneading..by hand if you can. Its lovely. Is that weird?? Its gonna be a stiff dough and tricky to knead but keep going. Once it feels kinda soft smooth and velvety (sounds like I’m talking toilet paper, I’m not just to clear that up) we are there. 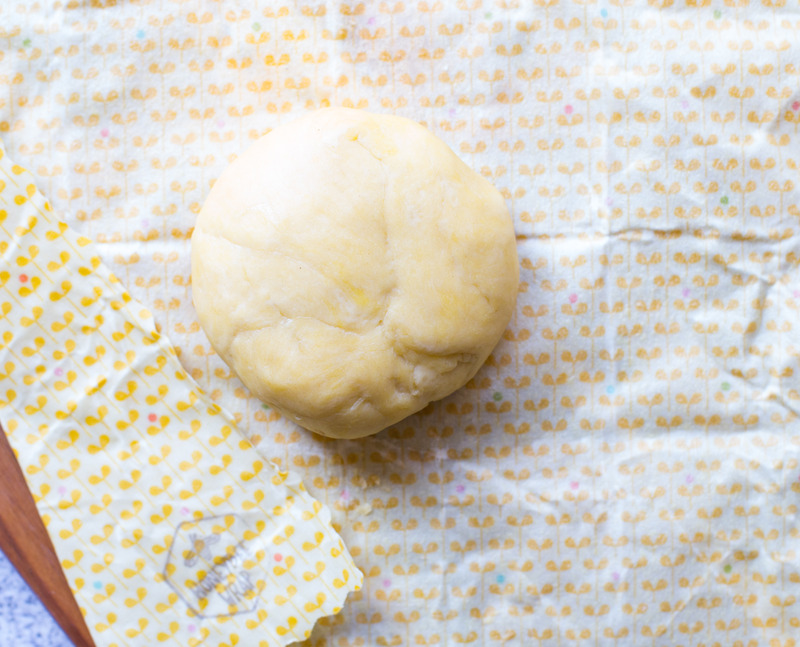 Wrap in some plastic wrap or if you have some funky Honey bee wraps get that baby around the dough. Let it rest for at least 30 mins allowing the gluten to work its magic. I left mine for a good few hours and it was super dooper! 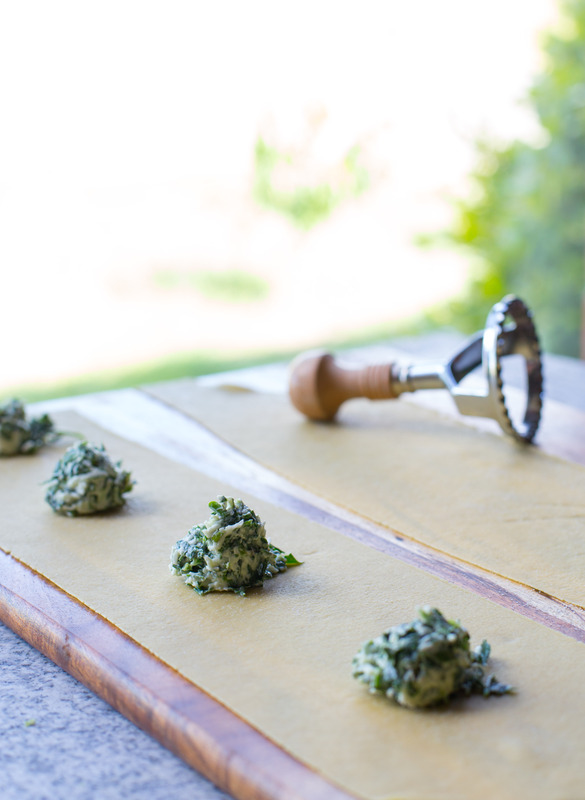 Cut the dough into 4 and on the largest setting for the pasta maker roll each piece 6-8 times folding each piece into 3 after each roll. If you don’t have the machine just roll out to half a centimetre and fold and roll. After this the pasta dough will start to feel that lovely smoothness again you are ready to move on. Now its just a matter of going through the numbers on the pasta maker. On the kitchen aid I have 1-8. 1 being the largest and 8 being the thinnest. I take mine to a 6. The experts say you should be able to read the paper through itor in my case my butchers block. If by hand just keep on rolling and rolling and rolling and when you wanna give up keep going you are nearly there. Woop Woop! So once you have got to ‘reading the newspaper through it’ pasta hook on the fettuccine attachment actually what ever style of pasta you want. Sorry my bossy mummy voice it coming out. Pop the pasta through the machine and lay on a tray and sprinkle generously with semolina, give it a toss about so all strands are included. Done, see that was easy right?? Hmmm I wonder who is still reading…. Ok if by hand and you’ve finished rolling grab the semolina and sprinkle over the pasta sheets. 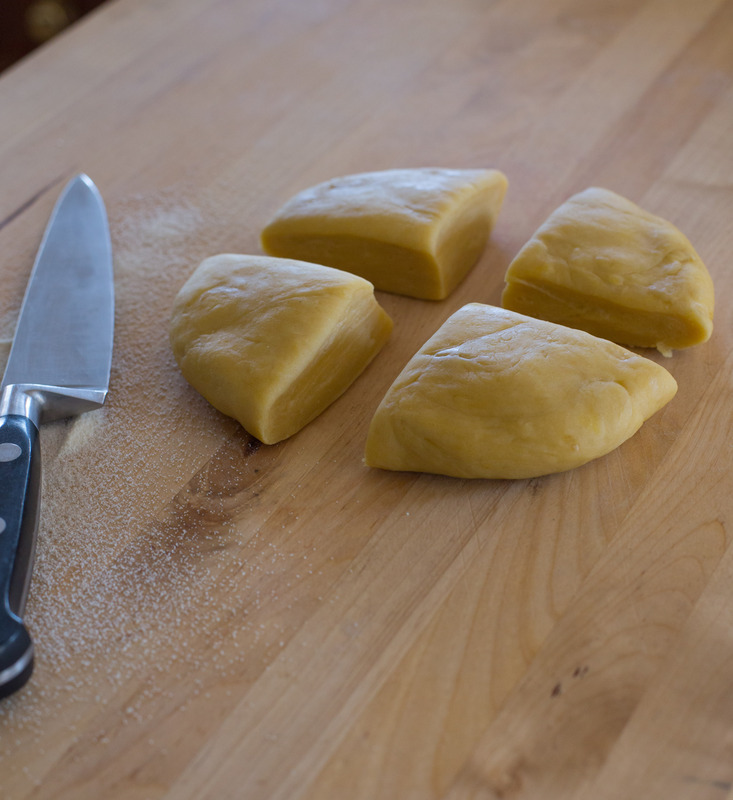 Fold them up gently on themselves and just take a knife to them and cut whatever shape or thickness you choose. 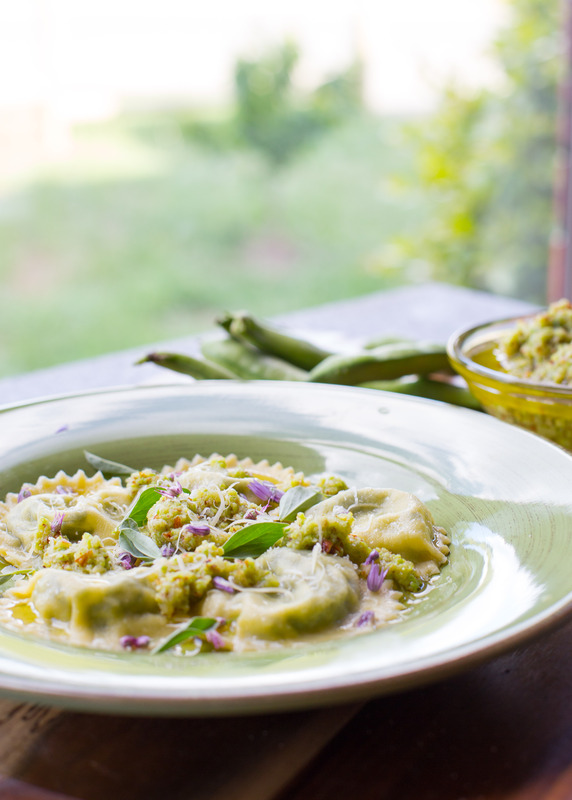 Unravel each piece and lay on a semolina sprinkled tray and coat evenly. Get a large pot full of water on to boil and a generous amount of salt. Once to the boil drop the pasta in. Set the timer for 2 minutes no longer it will go soggy. Drain add a glug of olive oil and add to the Asparagus pan below. Heat a large frying pan with first amount of olive oil and once hot throw in the asparagus and the lemon zest and saute for 2 minutes. 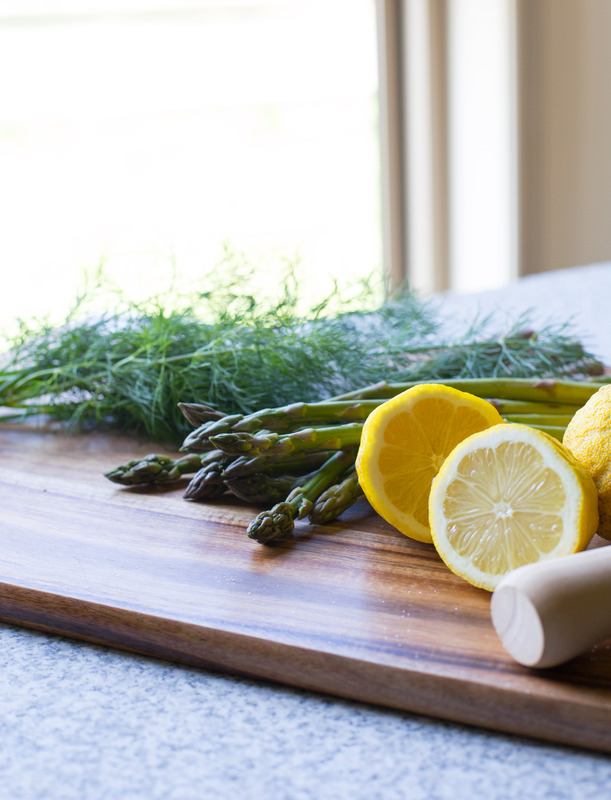 Squeeze the lemon juice over the asparagus cook for another 30 secs. 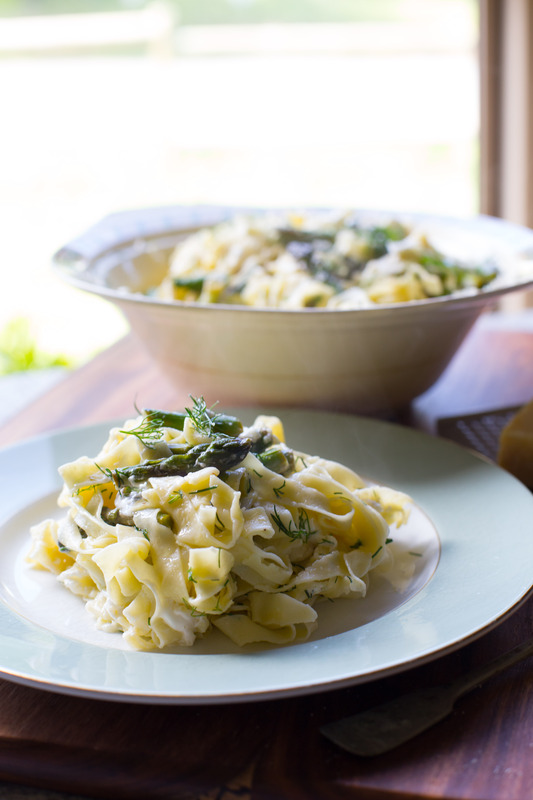 Take off the heat and add the pasta, dill and extra virgin olive oil gently toss together. Add the goats cheese crumbled, salt and pepper and a grating of parmesan. 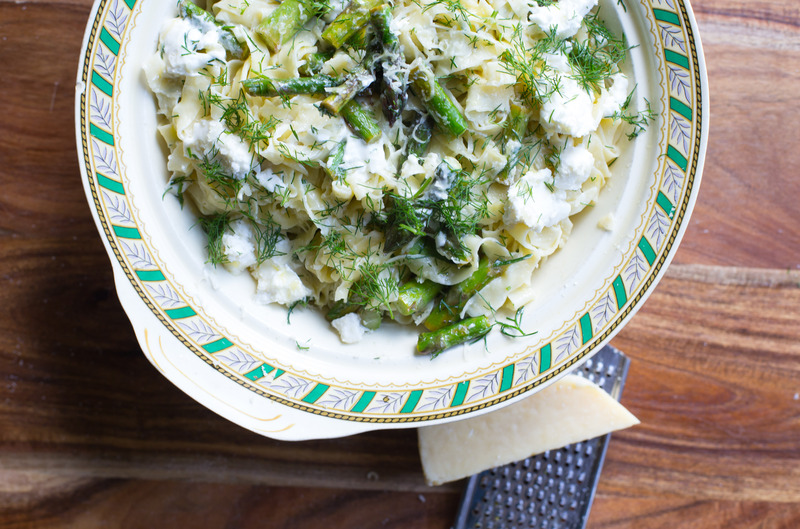 Serve straight away topping off with some fresh dill and parmesan. If you leave this too long the pasta gets a little sticky and you end up with 1 giant pasta knot! Not that attractive or impressive but it still tastes nice. Holy Moly the sun it out and its a magnificent day. I love spring it’s a beautiful season. Maybe because we have been shut up inside for so many dark months any good weather is a blessing! With spring comes the start of the growing season. 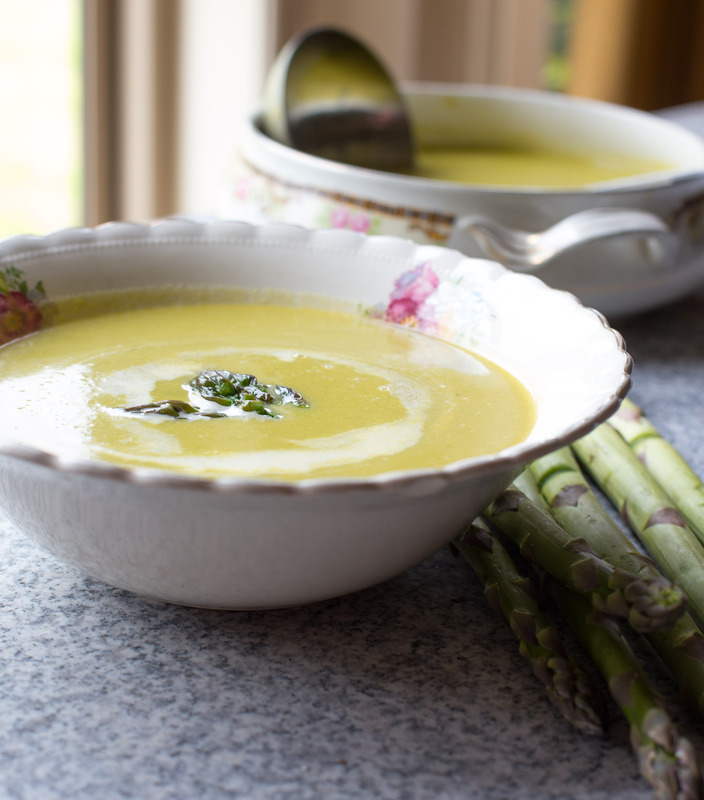 Those long-awaited tender spears of asparagus, so delicious lightly steamed with butter, char grilled leaving a superb crunch with a delicate hint of smoke, tossed through pasta (recipe to come) or in a beautiful light flavoursome spring soup. I know you are probably thinking soup? 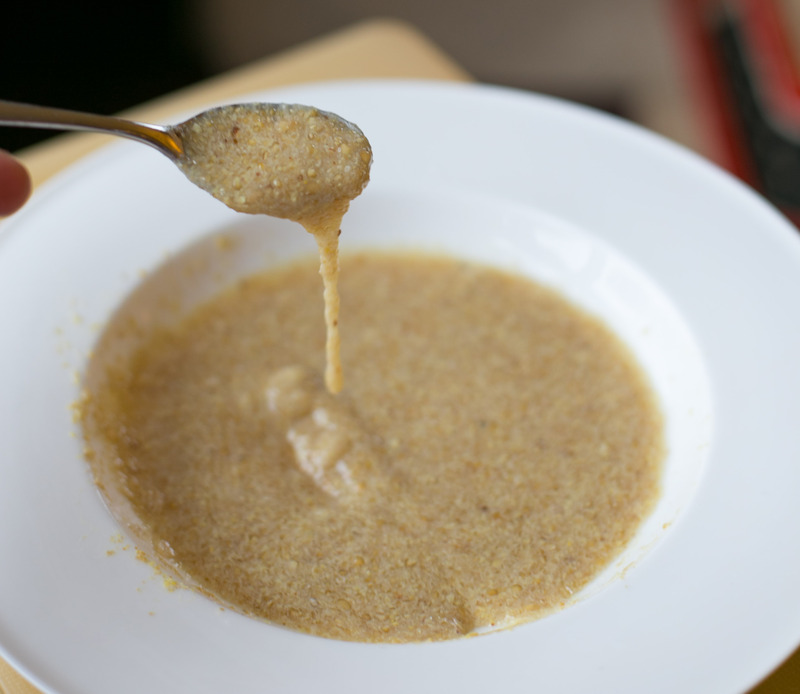 It’s too warm for that but for some reason a bowl of this with some fresh bread spread with some salty butter makes the most satisfying spring lunch. Just try it, trust me. In a stockpot heat the oil and throw in the onion. Cook this on medium/low heat until its translucent and soft. I don’t want any colour on those onions. I’m looking for soft and sweet. Once you are happy throw in the potato and mix this together for a couple of minutes. The potato is likely to stick so keep it moving. Turn to a simmer and add those beautiful green stems (remembering to save those tips for later). Let this all cook down for 15-20 minutes or until the potato is tender. Once its all cooked its time to whiz together either in a food processor, stick blender or a thermomix. I like this soup super smooth but its your choice, remember there’s no rules. You’ve got to eat it so take charge! Pour the soup back into the pot and season with salt and pepper and stir through the cream. Remember to taste it make sure the seasoning is how you like it and that’s it done! On to the tips..
Heat a pan or griddle pan to hot. While the pan is heating up toss the asparagus tips in a splash of olive oil, salt and pepper. Cook the tips only for 1 minute and no more, I want crunch here! Serve the crunchy griddled tips on top of the soup with an extra swirl of cream! Enjoy in the sunshine with a chunk of fresh bread and lashings of salty butter. Today is bordering on spring. Its cold and I have the fire on! The bonus is I have a great excuse to make more soup. Now we all know this time of year is slim pickings in the vege patch. The ‘transition’ phase as I like to call it. End of winter crops and not quite spring/summer crops. My kale has bolted, tatsoi too and my silver beet is threatening. I am trying to utilise what is left before it leaves me for good. My dad kindly handed over some of his ‘wintered’ carrots-too big and woody to eat raw but still fine to soup them. My little helper below stealing the ‘not’ soup carrots. The woody soup carrots didn’t get a chance to be photographed. I forgot. 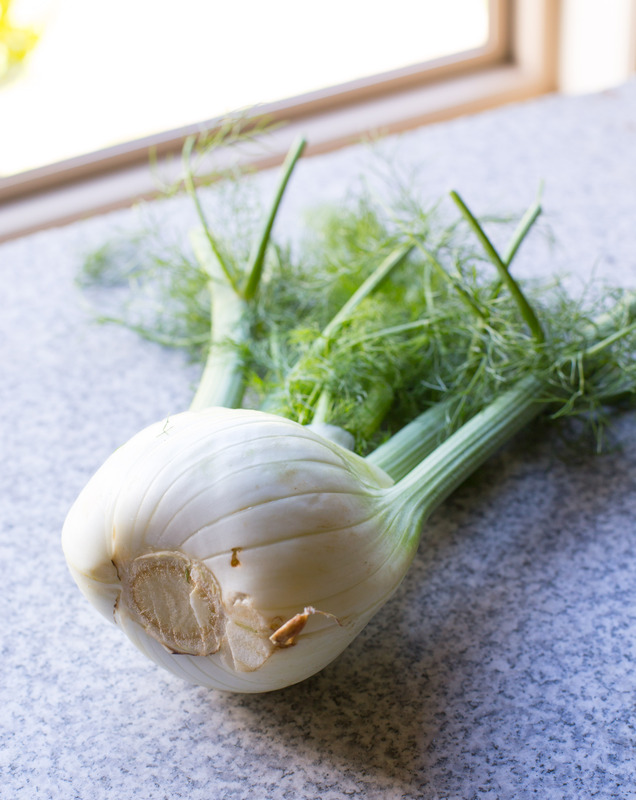 My organic vege box has featured fennel every order and I’ve been storing them up in the fridge will little or no idea what to do with them…until now. Look they are so pretty.. I added a wee twist to the soup (evolved while my soup bubbled away). I call it my fennel and almond puree or as my sister described it (as she munched away on it on toast) pate. She dislikes fennel and almond tasting things so I was not holding a lot of hope for a thumbs up from her. She liked it and even had a second piece of toast with it on. In a stockpot add your oil and pop the heat on med/high. Add your onion and garlic and when the onion has turners a translucent colour add your fennel. 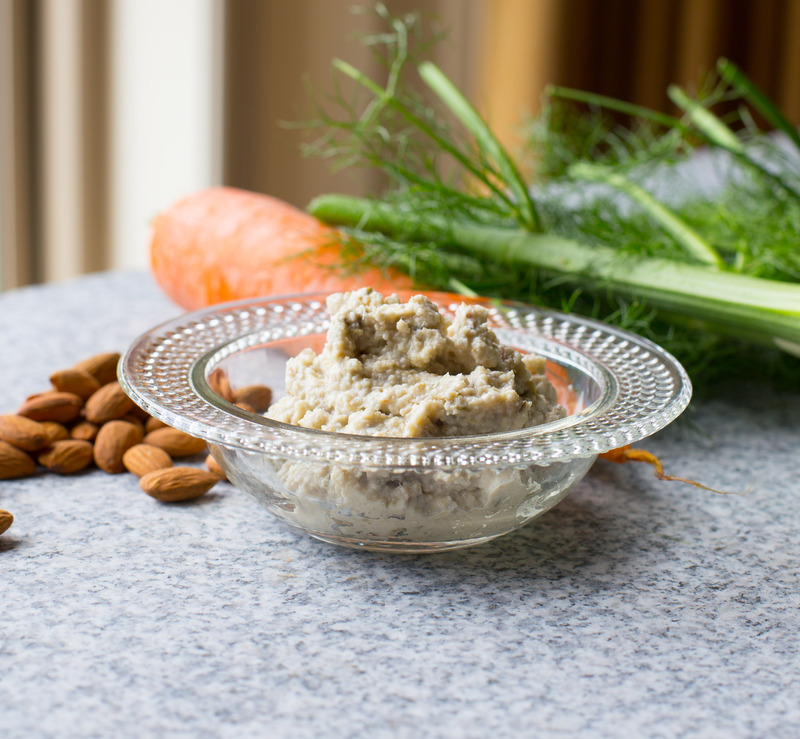 Sweat the fennel (350gm) for around 5 minutes and then throw in the carrots and the almonds (100gm). Give everything a good stir up and let the carrots and almonds get acquainted with the fennel mix and cook for another 5 minutes. Pour in the vegetable stock and bring to the boil. 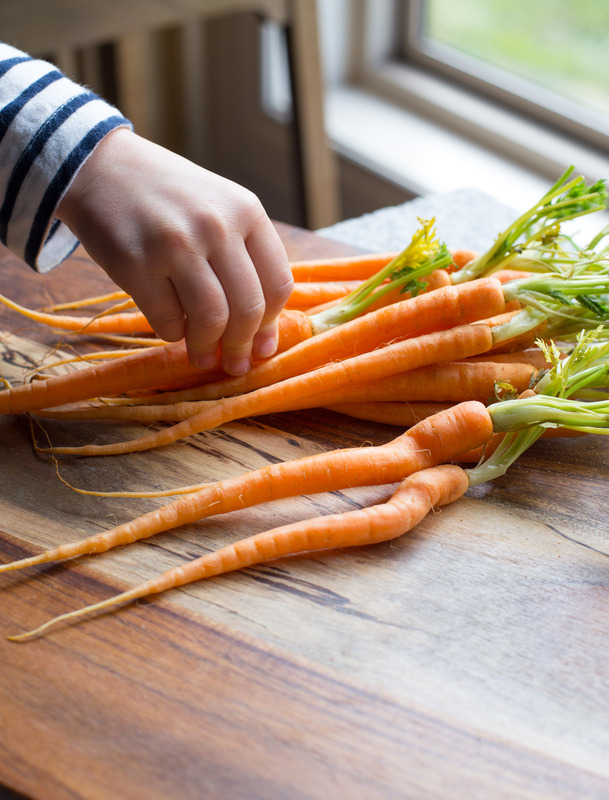 Once to the boil turn the heat down, pop a lid on and simmer for 20-25 minutes until the carrots are soft and tender. Now its time get down to some blitzing. 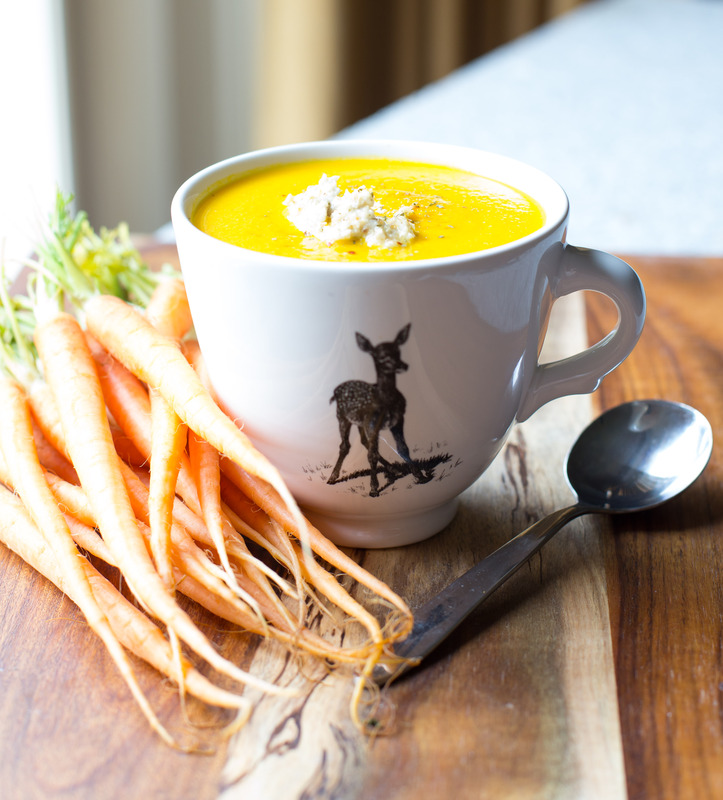 Get all the soup into a whizzy machine of your choice and puree until smooth. 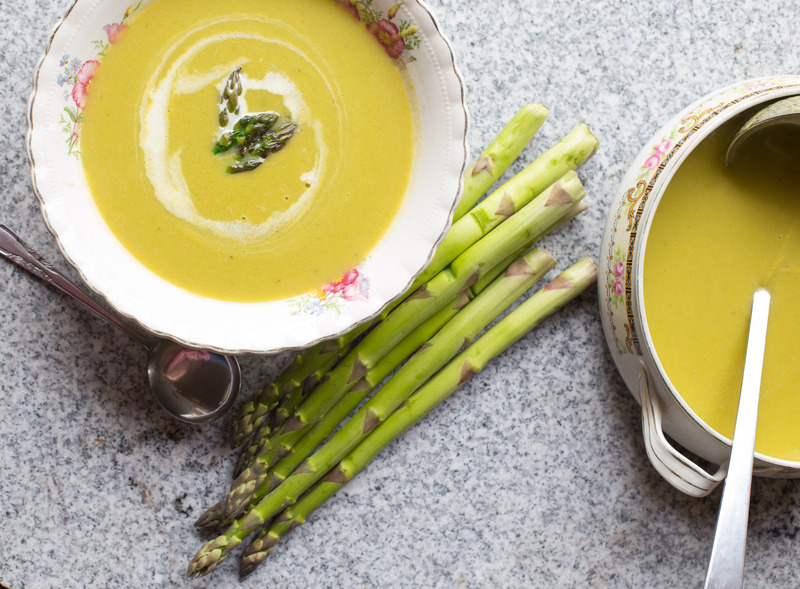 Pour the soup back into the pan to keep warm while you make the almond and fennel puree. In a pan pop the almonds, almond milk and fennel and bring to the boil, turn down and simmer with the lid on. Simmer this for 20 minutes and check that the fennel is tender. Again pop this mix with the fennel seeds into a blender and whizz until smooth. You may need add a bit more almond milk to loosen the mix, just see how you go. Don’t forget to season with salt and pepper at this point too. Ok doesn’t look the prettiest but take my word for it, its yummy. Once the puree is ready its time to eat, slurp, drink what ever just get it into a bowl and consume!! Hey my fellow tofu lovers, or not. 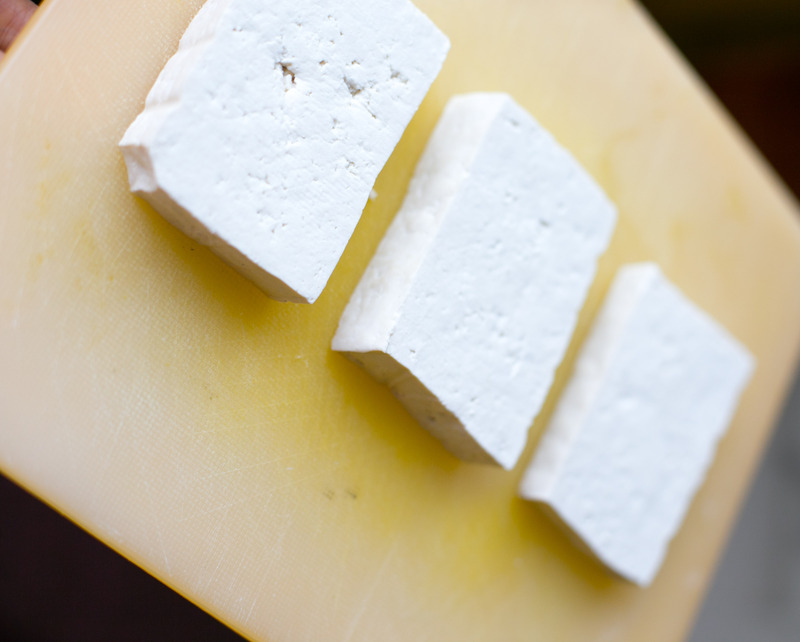 Today I’m talking about stepping tofu up a notch and making it into crunchy yummy goodness. We do love a bit of Japanese food in our house and maybe 2-3 times a week Miss 5 asks for sushi in her lunchbox. I’m happy to oblige. My pantry (if you haven’t already guessed) is pretty much stocked with EVERYTHING you could imagine. I had the makings of tofu katsu pretty much at my finger tips. Once cooked this tofu katsu thingy will keep in the fridge happily for a couple of days and can be reheated in the oven where is will safely crisp up nicely. I’m always up for some prep ahead kinda meals! Get the mushroom frying ASAP as we need these to cool to construct. In a hot pan with a good glug of oil throw the rough chopped mushrooms in the pan. Once most of the moisture has been fried off add the soy and fry for 30 secs. 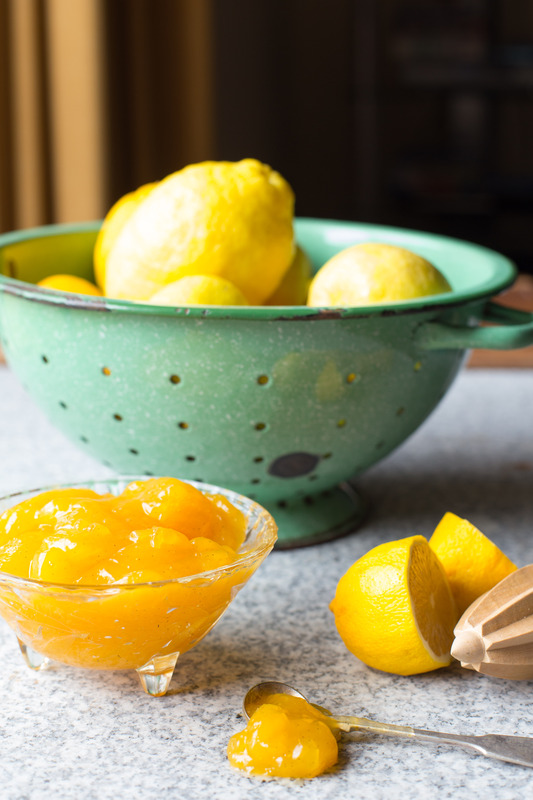 Pop these into a bowl to cool. 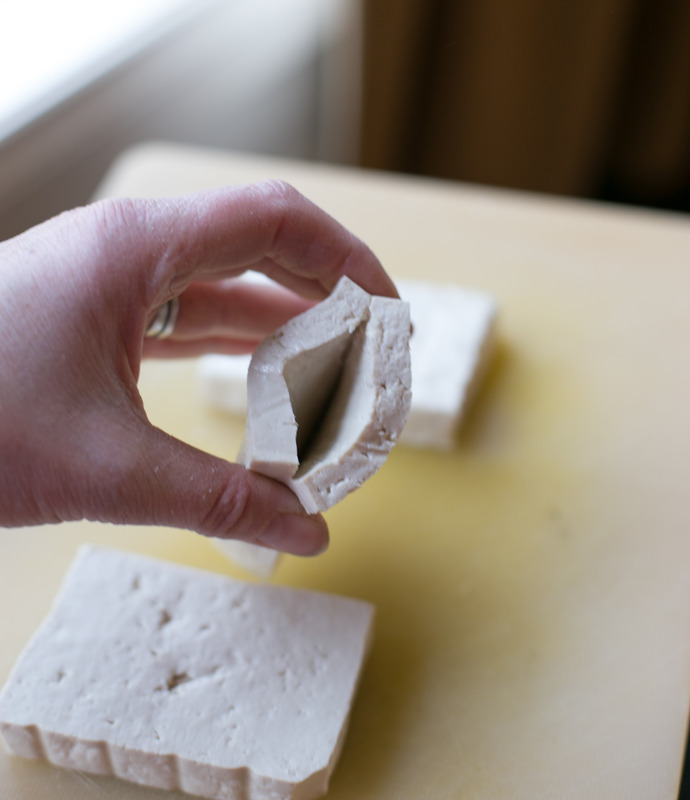 Cut your tofu into nice big chunks-2cm thick and lay on some paper towels. We want as much of the moisture out of these chunks as possible. Mean while back at recipe mix the ground flaxseed with enough water to make a runny consistency. It will thicken up over time and look like glue but keep adding water to thin it down. This IS the glue you need between the flour and the panko. Grab a couple of shallow bowls or plates and lay to a good handful of flour in one and panko in another. Now this is a tricky stage. 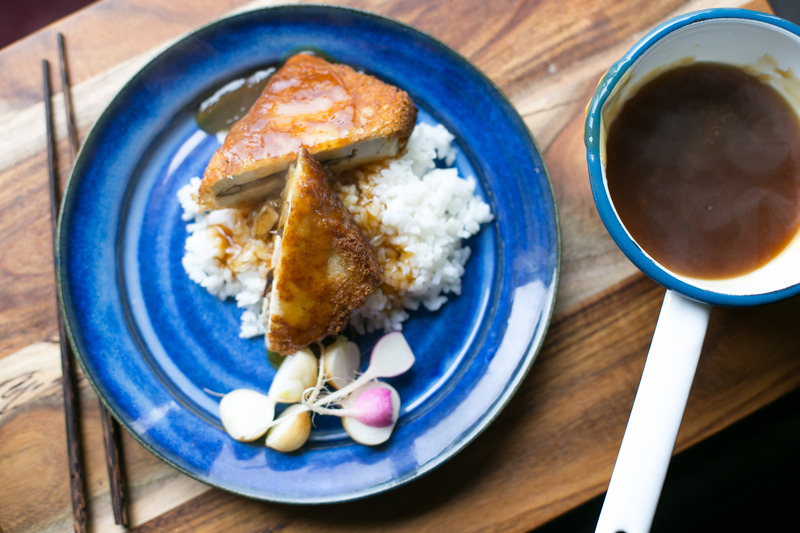 Get a knife and you want to make a ‘pocket’ in the middle of your tofu. This is where you are going to stuff your mushrooms. 1-2 teaspoons of mushrooms per tofu piece will be fine. Once all have been suitably stuffed roll them in a flour dust bath then a flaxseed coating then panko to finish off. You can at this point double coat so dip again in the flaxseed then the panko for extra crispness. Repeat until all pieces are panko-ed. Heat a heavy based frying pan with enough oil to shallow fry. 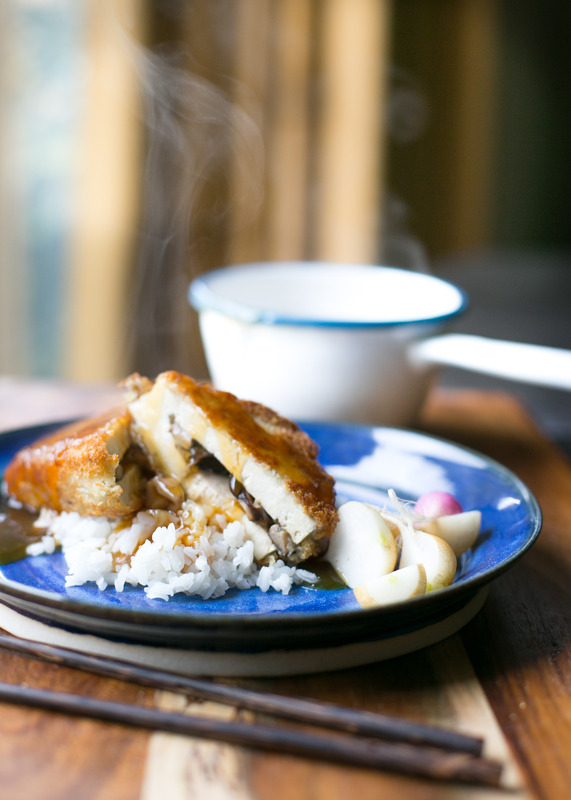 Keep on a medium heat and fry the tofu katsu until one side is golden then gently flip and repeat with the other side. Maybe 10 mins. Don’t have the heat too hot otherwise you will burn the panko. Once cooked to a beautiful golden crispness drain on some paper towels and eat with rice and sticky miso sauce or leave to cool and keep in the fridge until needed. To reheat bump the oven up to 180c Fanbake and cook for 10 mins, the crispness with reappear and everything will be lovely! Hello first day of spring I’ve got high hopes for you. Yes you got us off to a very cold minus 3.2 start but holy moly the sun is out, my washing is swinging in the breeze. I am one happy lady! So I thought today I would share a ‘sunny’ recipe, due to the arrival of spring I think it’s appropriate. One of my good friends gave me some homemade lime curd, divine on its own but how else do I use this pot of yummy-ness?? I love receiving food gifts and I love giving them. Theres something so satisfying about giving a homemade food gift, knowing that someone else will have the joy and pleasure of eating. I ended up with the idea of Coconut Pancakes or possibly hot cakes as they are small and thick, slightly cake like but super light and fluffy. I originally served these up as an afternoon snack for my 3 hungry little people. I described them as coconut pancakes with lime ‘jam’ ( I have a suspicious 3-year-old so adjusting the name is quite acceptable). Within a blink of an eye the plate was cleared and with 3 sets of beautiful fluttering eyelashes staring up at me they asked as politely as they could “Please mummy could we have more”. YAY! Another win for mummy. So if you have been gifted a jar of curd or you are in the position to make some curd get making or eating. If you haven’t got a curd recipe to hand find one here, its lemon curd recipe but there’s no harm in changing the lemon to lime. Get your frying pan on medium heat and throw in a little coconut oil to melt. Make a well in the centre and add your egg. Slowly pour in the coconut milk and mix gently. Add the melted coconut oil and vanilla, we want the consistency to be of double cream. Once this is reached get frying, don’t hang around when using self-raising flour as it starts to deactivate when you add your wet ingredients. Fry them until the underside is golden and you start to see little bubbles appear on the top and the mix looks like its setting. Flip and cook only for a short time as most of the cooking has already been done. Continue to make the pancakes until the mix is finished and keep warm under a tea towel or I like to use a tortilla warmer. At this point you can serve just with the lime curd as is or if you want more of a brekkie meal do this next step. Heat a griddle until its smoking and cut a banana length ways and cut some slices of pineapple, griddle until caramelised. 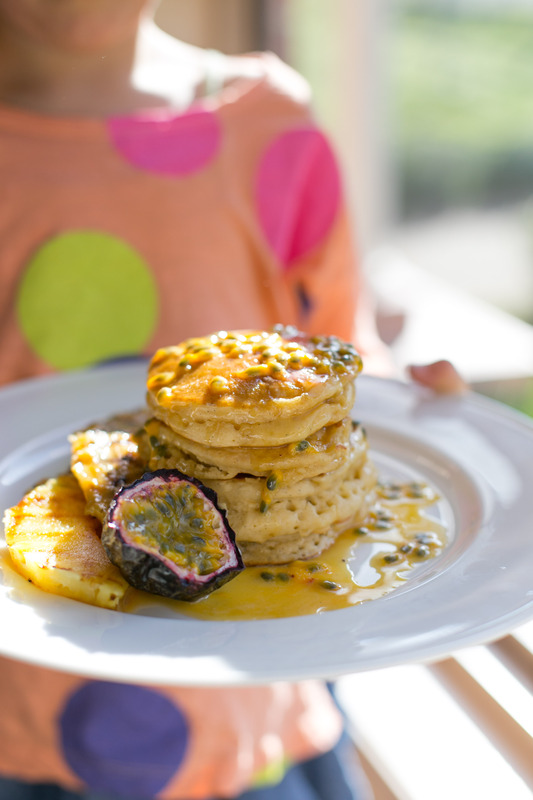 Stack those tropical coconutty pancakes drizzle over the curd, scoop out the passionfruit seeds and let them fall or shall I say ‘cascade’ (am I selling it to you?) 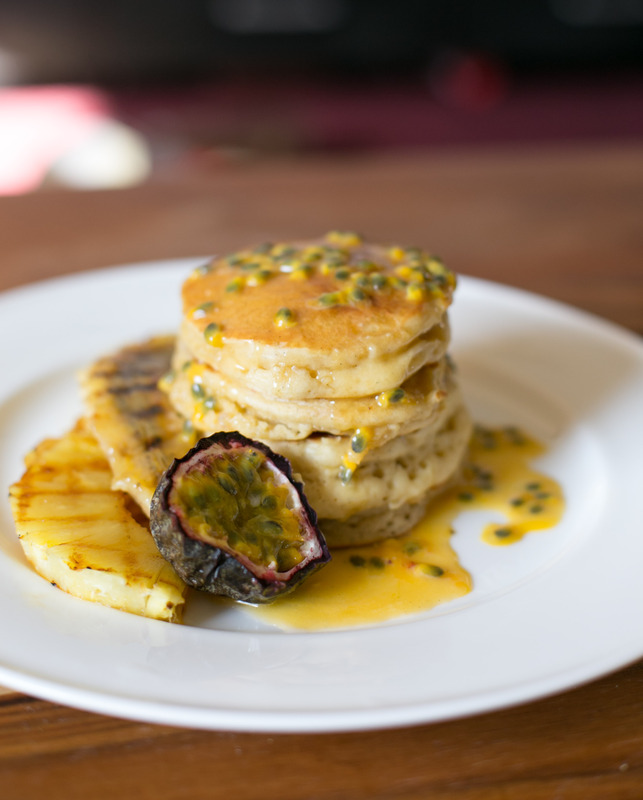 over the pancakes and serve with a side of caramelised pineapple and bananas. This is best enjoyed in the sunshine with a hot cup of coffee or a Pina Colada but then you’ve gotta be caught in the rain and that’s not ok, we’ve had enough rain and its supposed to spring! Oh but some peace and quiet (I can only wish) is a winner. Saturday night done right. Homegrown figs, @beesustainable banksia honey, Camembert and a G&T. Thanks mum and dad! The perks of having them down the road!